Marijuana (marihuana), Cannabis sativa L., also known as Indian hemp, is a member of the Cannabaceae or hemp family, thought to have originated in the mountainous districts of India, north of the Himalayan mountains. The herb was referred to as “hempe” in A.D. 1000 and listed in a dictionary under that English name. Supporters of the notorious Pancho Villa first called the mood-altering herb they smoked marijuana in 1895 in Sonora, Mexico. The term hashish, is derived from the name for the Saracen soldiers, called hashashins, who ingested the highly potent cannabis resin before being sent out to assassinate enemies. 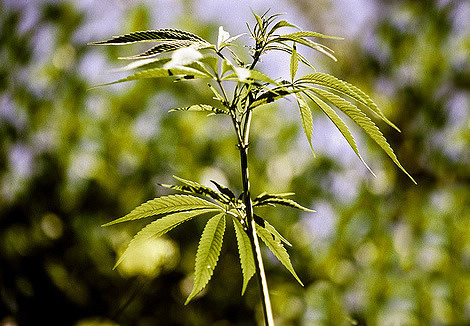 Two related species of cannabis are C. ruderalis and C. indica, a variety known as Indian hemp. Indian hemp grows to a height of about 4 ft (1.2 m) and the seed coats have a marbled appearance. The species C. sativa L. has many variations, depending on the origin of the parent seed and the soil, temperature, and light conditions. These factors also affect the relative amounts of THC (tetra-hydrocannabinol) and cannabidiol, the chemicals present in varying amounts in cannabis that determine if the plant is primarily a fiber type or an intoxicant. Generally the species grown at higher elevations and in hotter climates exudes more of the resin and is more medicinally potent. Marijuana is a somewhat weedy plant and may grow as high as 18 ft (5.4 m). The hairy leaves are arranged opposite one another on the erect and branching stem. Leaves are palmate and compound, deeply divided into five to seven narrow, toothed and pointed leaflets. Male and female flowers are small and greenish in color and grow on separate plants. Male flowers grow in the leaf axils in elongated clusters. The female flowers grow in spike-like clusters. The resinous blossoms have five sepals and five petals. The male and female blossoms can be distinguished at maturity. The male plant matures first, shedding its pollen and dying after flowering. Female plants die after dropping the mature seeds. Marijuana produces an abundance of quickly germinating seeds. This hardy annual is wind pollinated and has escaped from cultivation to grow wild along roadsides, trails, stream banks, and in wayside places throughout the world. The plant matures within three to five months after the seed has been sown. Cannabis was called a “superior” herb by the Emperor Shen-Nung (2737–2697 B.C. ), who is believed to have authored the work. Cannabis was recommended as a treatment for numerous common ailments. Around that same period in Egypt, cannabis was used as a treatment for sore eyes. Centuries later, around 700 B.C., the Assyrian people used the herb they called Qunnabu for incense. The ancient Greeks used cannabis as a remedy to treat inflammation, earache, and edema (swelling of a body part due to collection of fluids). Shortly after 500 B.C. the historian and geographer Herodotus recorded that the peoples known as Scythians used cannabis to produce fine linens. They called the herb kannabis and inhaled the “intoxicating vapor” that resulted when it was burned. By the year 100 B.C. the Chinese were using cannabis to make paper. Cannabis use and cultivation migrated with the movement of various traders and travelers, and knowledge of the herb’s value spread throughout the Middle East, Eastern Europe, and Africa. Around A.D. 100, Dioscorides, a surgeon in the Roman Legions under the Emperor Nero, named the herb Cannabis sativa and recorded numerous medicinal uses. In the second century, the Chinese physician Hoa-Tho, used cannabis in surgical procedures, relying on its analgesic properties. In ancient India, around 600, Sanskrit writers recorded a recipe for “pills of gaiety,” a combination of hemp and sugar. By 1150, Moslems were using cannabis fiber in Europe’s first paper production. This use of cannabis as a durable and renewable source of paper fiber continued for the next 750 years. By the 1300s, government and religious authorities, concerned about the psychoactive effects on citizens consuming the herb, were placing harsh restrictions on its use. The Emir Soudon Sheikhouni of Joneima outlawed cannabis use among the poor. He destroyed the crops and ordered that offenders’ teeth be pulled out. In 1484, Pope Innocent VIII outlawed the use of hashish, a concentrated form of cannabis. Cannabis cultivation continued, however, because of its economic value. A little more than a century later, the English Queen Elizabeth I issued a decree commanding that landowners holding 60 acres (24 ha) or more must grow hemp or pay a fine. Commerce in hemp, which was primarily valued for the strength and versatility of its fibers, was profitable and thriving. Hemp ropes and sails were crossing the sea to North America with the explorers. By 1621, the British were growing cannabis in Virginia where cultivation of hemp was mandatory. In 1776, the Declaration of Independence was drafted on hemp paper. Both President George Washington and President Thomas Jefferson were advocates of hemp as a valuable cash crop. Jefferson urged farmers to grow the crop in lieu of tobacco. By the 1850s, hemp had become the third largest agricultural crop grown in North America. The U.S. Census of that year recorded 8,327 hemp plantations, each with 2,000 or more acres in cultivation. But the invention of the cotton gin was already bringing many changes, and cotton was becoming a prime and profitable textile fiber. More change came with the introduction of the sulfite and chlorine processes used to turn trees into paper. Restrictions on the personal use of cannabis as a mood-altering, psychoactive herb, were soon to come. This inebriating effect of marijuana use has fueled the controversy and led to restrictions that have surrounded marijuana use throughout history in many cultures and regions of the world. Cannabis use has been criminalized in some parts of the United States since 1915. Utah was the first state to criminalize it, then California and Texas. By 1923, Louisiana, Nevada, Oregon, and Washington had legal restrictions on the herb. New York prohibited cannabis use in 1927. In 1937, the federal government passed the Marijuana Tax Act, prohibiting the cultivation and farming of marijuana. This bill was introduced to Congress by then Secretary of the Treasury Andrew Mellon, who was also a banker for the DuPont Corporation. That same year, the DuPont Chemical Company filed a patent for nylon, plastics, and a new bleaching process for paper. The 1937 Marijuana Transfer Tax Bill prohibited industrial and medical use of marijuana and classified the flowering tops as narcotic, and restrictions on the cultivation and use of cannabis continued. Marijuana was categorized as an illegal narcotic, in the company of LSD and heroin, cocaine, and morphine. Illegal use continued. The FBI publication, Uniform Crime Reports for The United States, 1966 reported that 641,642 Americans were arrested for marijuana offenses that year, with as many as 85% of these arrests for simple possession, rather than cultivation or commerce. In a reversal of the state-by-state progression of criminalizing marijuana that led to the 1937 Marijuana Transfer Tax Bill, there is a movement underway, state by state, to endorse the legalized use of medical marijuana. By 1992, 35 states in the United States had endorsed referenda for medical marijuana. A growing body of scientific research and many thousands of years of folk use support the importance of medical marijuana in treatment of a variety of illnesses, and the economic value of hemp in the textile, paper, and cordage industries has a long history. The controversy and misinformation persists around this relatively safe and non-toxic herb. The World Health Organization, in a 1998 study, stated that the risks from cannabis use were unlikely to seriously compare to the public health risks of the legal drugs, alcohol and tobacco. And despite thousands of years of human consumption, not one death has been directly attributed to cannabis use. According to Lester Grinspoon, MD, and James B. Bakalar, JD, in a 1995 Journal of the American Medical Association article, “Marijuana is also far less addictive and far less subject to abuse than many drugs now used as muscle relaxants, hypnotics, and analgesics. 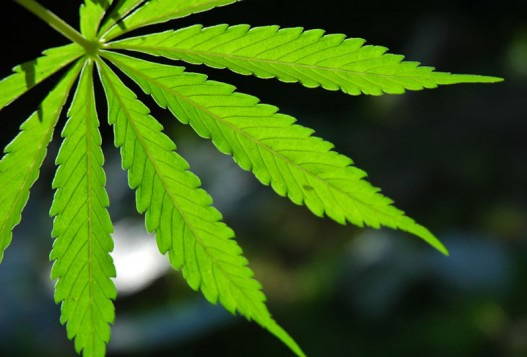 Every part of the cannabis plant, including buds, leaves, seeds, and root, has been utilized throughout the long history of this controversial herb. Despite persistent legal restrictions and severe criminal penalties for illicit use, marijuana continues to be widely used in the United States, and throughout the world, both for its mood-altering properties and its proven medicinal applications. The conflicting opinions on the safety and effectiveness of cannabis in a climate of prohibition make any discussion of its beneficial uses politically charged. Marijuana has analgesic, anti-emetic, anti-inflammatory, sedative, anticonvulsive, and laxative actions. Clinical studies have demonstrated its effectiveness in relieving nausea and vomiting following chemotherapy treatments for cancer. The herb has also been shown to reduce intraocular pressure in the eye by as much as 45%, a beneficial action in the treatment for glaucoma. Cannabis has proven anticonvulsive action, and may be helpful in treating epilepsy. Other research has documented an invitro tumor inhibiting effect of THC. Marijuana also increases appetite and reduces nausea and has been used with AIDS patients to counter weight loss and “wasting” that may result from the disease. Several chemical constituents of cannabis displayed antimicrobial action and antibacterial effects in research studies. The components CBC and d-9-tetrahydrocannabinol have been shown to destroy and inhibit the growth of streptococci and staphylococci bacteria. In 2002, the Dutch government announced that a small trial would begin in the country to study the effects of medical marijuana on patients with multiple sclerosis. After extending the number of participants in the trial, researchers also hoped to add patients with neuralgia and lower back pain to the study. Cannabis contains chemical compounds known as cannabinoids. 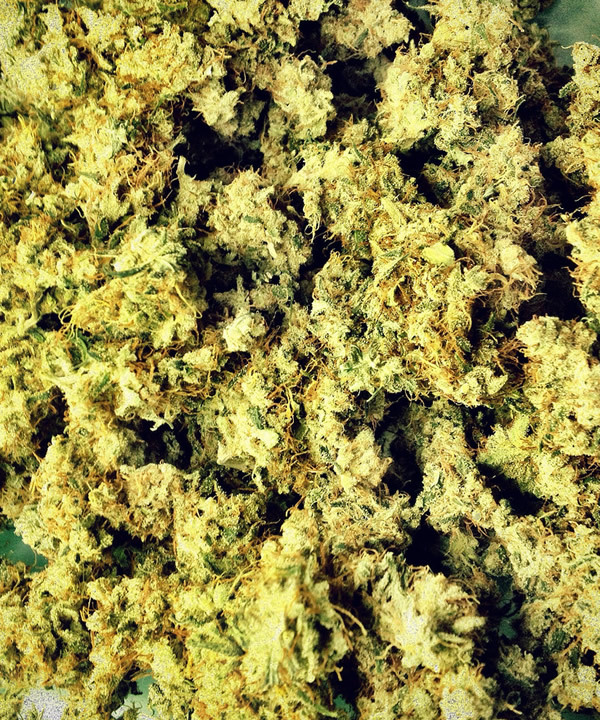 Different cannabinoids seem to exert different effects on the body after ingestion. Scientific research indicates that these substances have potential therapeutic value for pain relief, control of nausea and vomiting, and appetite stimulation. The primary active agent identified to date is 9-tetrahydrocannabinol, known as THC. This chemical may constitute as much as 12% of the active chemicals in the herb, and is said to be responsible for as much as 70–100% of the euphoric action, or “high,” experienced when ingesting the herb. The predominance of this mental lightness or “euphoria” depends on the balance of other active ingredients and the freshness of the herb. THC degrades into a component known as cannabinol, or CBN. This relatively inactive chemical predominates in marijuana that has been stored too long prior to use. Another chemical component, cannabidiol, known as CBD, has a sedative and mildly analgesic effect, and contributes to a somatic heaviness sometimes experienced by marijuana users. Before prohibition, cannabis was recommended for treatment of gonorrhea, angina pectoris (constricting pain in the chest due to insufficient blood to the heart), and choking fits. It was also used for insomnia, neuralgia, rheumatism, gastrointestinal disorders, cholera, tetanus, epilepsy, strychnine poisoning, bronchitis, whooping cough, and asthma. Other phytotherapeutic (plant-based therapeutic) uses include treatment of ulcers, cancer, emphysema, migraine, and anxiety. The United States federal government policy prohibits physicians from prescribing marijuana, even for seriously ill patients because of possible adverse effects, and the disputed belief that cannabis is dangerously addictive. Former U.S. Attorney General Janet Reno warned that physicians in any state who prescribed marijuana could lose the privilege of writing prescriptions, be excluded from Medicare and Medicaid reimbursement, and even be prosecuted for a federal crime, according to a 1997 editorial in the New England Journal of Medicine. Yet in 1996, California passed a law legalizing medical use of marijuana and many other states have introduced similar laws. The debate in the United States over medical use of the drug continues. Some opponents believe that the movement to legalize marijuana for medicinal purposes is led by those who want the drug legalized for recreational purposes. Cannabis extracts, prepared for medicinal application, are prohibited in the United States. Marijuana is ingested by smoking, which quickly delivers the active ingredients to the blood system. The dried herb is also variously prepared for eating. The essential oil consists of beta caryophyllenes, humules, caryophyllene oxide, alpha-pinenes, beta-pinenes, limonene, myrcene, and betaocimene. The oil expressed from the seeds is used for massage and in making salves used to relieve muscle strain. Research has shown that cannabis acts to increase heart frequency by as much as 40 beats per minute. A study reported by The American Heart Association in February 2000, concluded that smoking marijuana can precipitate a heart attack in persons with pre-existing heart conditions. One hour after smoking marijuana, the likelihood of having a heart attack is four and one-half times greater than if the person had not smoked, according to the research. A 2002 report cautioned that marijuana use during pregnancy cuts the child’s birth weight, a possible indication of problems for the unborn child. Early results indicate that pregnant women should avoid using marijuana. An additional health concern is the effect that marijuana smoking has on the lungs. Cannabis smoke carries more tars and other particulate matter than tobacco smoke. The ability to safely operate automobiles and machinery can be impaired for up to eight hours after ingesting the herb. Chronic abuse results in “laryngitis, bronchitis, apathy, psychic decline and disturbances of genital functions,” according to the PDR. In early 2002, several published studies showed conflicting results about the effects of long-term chronic use of marijuana on memory and cognitive function. For the most part, however, these effects seem to lessen after use is halted. Further research on the effects of marijuana on memory and how long those effects may last should continue. Some people may be hypersensitive to marijuana. They may experience paranoia or be allergic or sensitive to the plant. Chronic sinus fungal infections have been linked to chronic marijuana smoking. Marijauna use may mask the perceived effects of alcohol and cocaine when the drugs are consumed together. 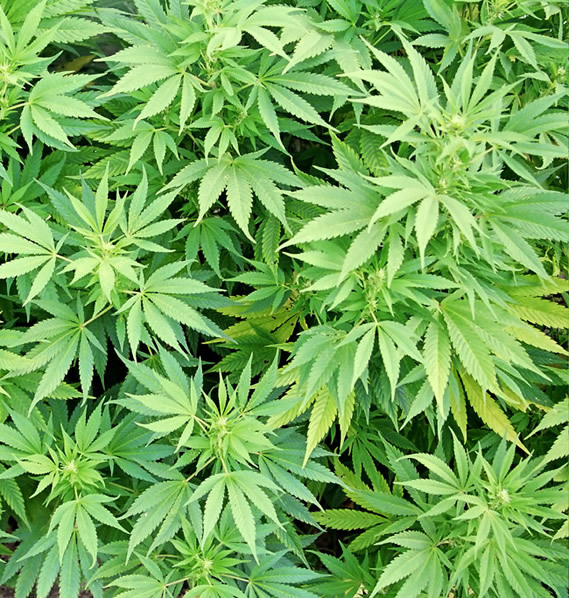 Marijuana is said to exert a synergistic effect with other medicinal agents. When used with nitrous oxide it may enhance the effect.